Riviera Zushi Marina boasts a superior status as Japan’s pioneer marina. It is located at an exceptional spot surrounded by the bright Shonan beach, which is only a 50-minute drive from the Tokyo metropolitan area. The marina offers comprehensive services in the areas of harbor operation, sports, restaurants, weddings, vacation condominium management, resort club operation and real estate. A large area designated for sports contains many facilities, including a yacht harbor, and this in particular has great appeal to those with strong interest in athletic activities. The numerous palm trees, colorful and stylish vacation condos, and many seaside and urban events form this “Comprehensive Seaside Resort” with a focus on sports and leisure to be enjoyed throughout the year. Seabornia faces the Sagami Bay, which is considered to be the best location for marine sports. It is blessed with a warm climate and a beautiful landscape overlooking the southernmost tip of the Miura Peninsula. As it features all the natural conditions required of a harbor, including depth of water and a calm bay, it has long been loved by many yachting and boating enthusiasts. 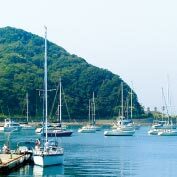 It is a multipurpose marina where boat fishing can be enjoyed year-round and cruises can be taken to the Izu Seven Islands and Boso Peninsula. It is widely known to the general public for Cynara, a famous classic yacht from England. 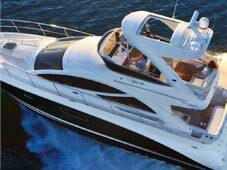 Through our restaurants, pool, boat licensing service, cruiser yachting school, maintenance service, to the sales of imported and used boats, our exceptional service structure and highly skilled staff offer comprehensive support for our customer’s marine activities. As a central base for marine sports we continue to actively expand our overall marine leisure activities. Shimoda is located at the southern tip of the Izu Peninsula. This area attracts many boat enthusiasts due to its prime location, being a hub on the route between Kanto and Kansai, a starting point for touring the seven islands of Izu, and a base for cruises out into the ocean. The local sea offers many great fishing spots for capturing swordfish and other varieties of sea life. There are also many nice cruising areas such as south and west Izu, as well as tourist spots on land. There are moorings and maintenance facilities for both small and large boats. 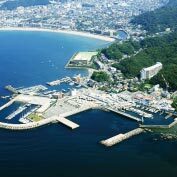 As one of the birthplaces of yachting in Japan, Hayama Marina is still popular for marine sports to this day. Since 2010 Riviera- Resort has been appointed as the designated operator by Kanagawa Prefecture and runs the facility under the motto of an "open port" in order to popularize marine activities in the area. 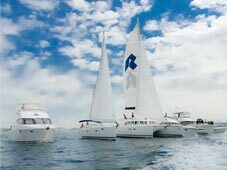 At Riviera Marine Club, large yachts and cruisers are shared by multiple members. We have the luxurious selection that you can purchase only here.